To fully enjoy the heavenly taste of steak, you need to use the right kind of knife to achieve that perfect cut. 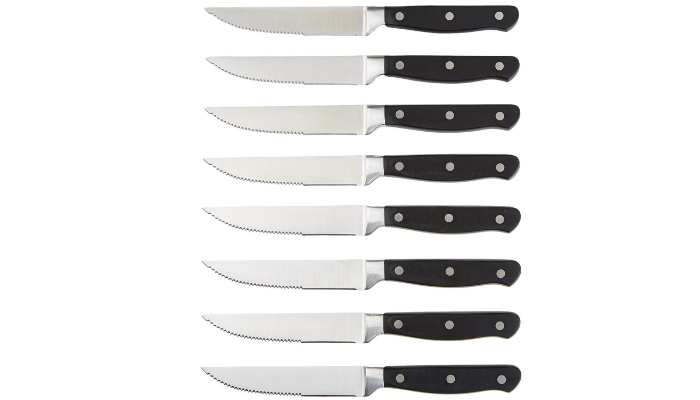 You should consider buying multiple steak knives as well for your family or houseguests. Since you’re looking for quality and value for money, we’re recommending the best steak knife set. Forget about the usual silver blade for a sec. Just take a look at how attractive black knives are. 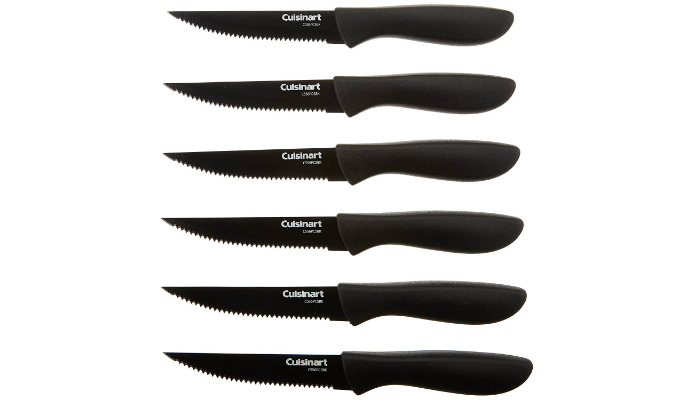 Cuisinart C55-6PCSBK Steak Knife Set is more than just an eye candy, though. The black color of the blade is actually ceramic. It covers the stainless steel blade for a nonstick finish. This is useful for smoother cuts. Honestly, you can’t see this awesome feature in most steak knives. That’s why you’re looking at a superior product. Because of its undeniable sharpness, this steak knife comes with a blade guard. You need this extra feature to preserve quality during storage. Since this product is a must-have, you may definitely give it to your loved ones on special occasions. Rest assured they’ll love it, even more so if they’re going to use it every day. It is a practical option that can stand the test of time. One common problem with steel knives is corrosion. 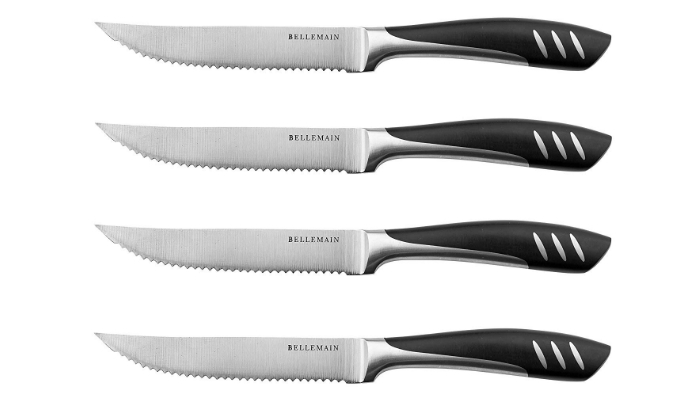 Fortunately, Bellemain Premium Steel Steak Knife is an exception. Its surgical-grade stainless steel blade can resist rust. 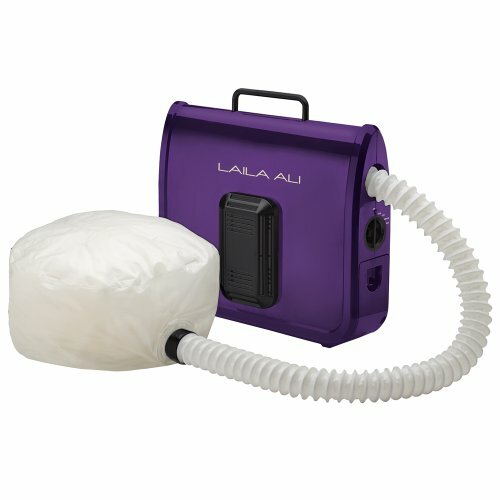 Here’s another interesting fact about this product. Unlike most metals that are heat-tempered, the steel blade of this steak knife is ice-tempered. That’s hard to beat when it comes to maintaining the edge. While the top product uses a ceramic coating to achieve a nonstick surface, this option uses a hollow ground instead. That design may be less effective, but it actually makes sense since the blade is pure steel. 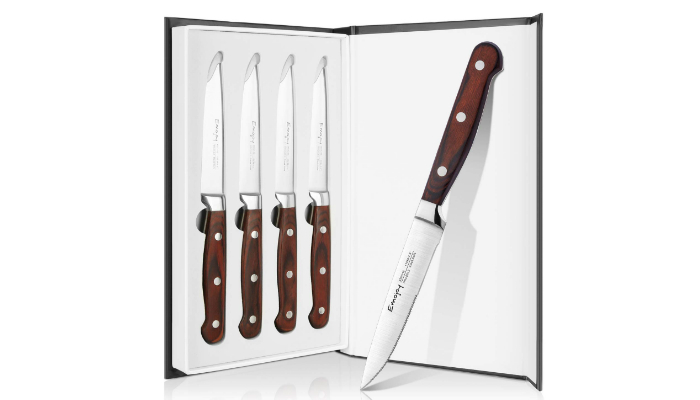 With its full-tang design, Emojoy Stainless Steel Steak Knife Set has that irresistible professional quality. Not only that; it also contains a special kind of metal. Its blades are made of imported ThyssenKrupp German steel with a high level of carbon. As soon as you receive this product, you may use it immediately. Why? The heat-treated blades are already sharpened to perfection on both sides. Because of its high-quality blade, expect straight cuts when you eat steak. As a plus, its rock-hollow dimples will provide a nonstick surface. If you want something classy, consider buying this set. The durable Pakkawood handles look so elegant. Not only that, they’re very comfortable for your hands. 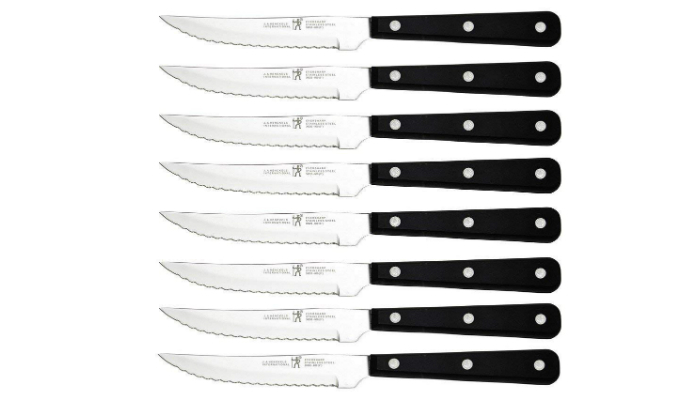 Another option made of German steel, Messermeister Avanta Steak Knife Set is sharp, corrosion-resistant, and durable. Its blades are also user-friendly because they’re easy to resharpen. To be more specific about the German steel composition, it is widely considered as the best type for knives. Technically labeled as X50CrMoV15, this metal is very easy to maintain. It also stays sharp for years when maintained properly. As you can see, J.A. Henckels International Steak Knife Set has big and small serrations. This type of blade guarantees sharpness that can last for years. It is ideal for cutting tough meat. Meanwhile, the handles have three rivets. This feature ensures performance and durability. By the way, have you noticed the narrow, straight form of the handles? While other knives focus on curves, this one is clearly flat and slim. If you prefer this shape, go ahead and buy this product. Believe it or not, AmazonBasics Premium Steak Knife Set doesn’t require sharpening. If you look closely, its edges have tiny serrations. The steel blade won’t stain, too. It is ideal for cutting meat doused in sauce. If you want something more affordable for simple home use, then you have to get your hands on this product. 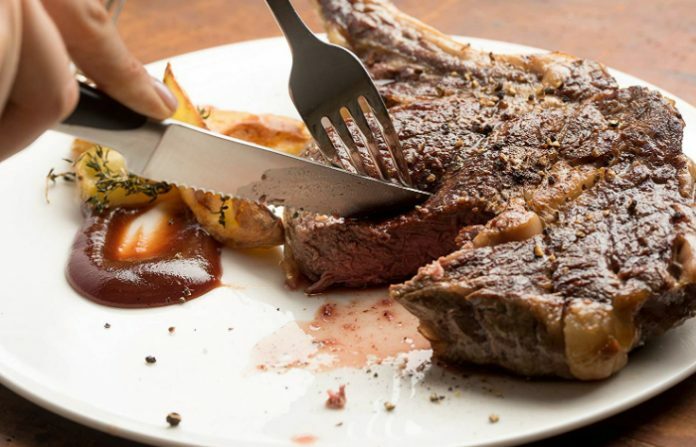 It’s surprisingly simple to choose the best steak knife set for your home. You just have to think about the blade and the handle. There are two types of edges you need to know. Simply choose between serrated and non-serrated blades. Serrated blades are perfect for home use. Their sharpness lasts longer than non-serrated ones without needing regular maintenance. That’s why most of our chosen products here are serrated. For professional use, however, you need non-serrated steak knives. Their straight blade cuts steak smoothly. It is also easier to sharpen and more durable than serrated blades. When it comes to the material, stainless steel will always be the best. It is strong and durable, which is the standard for steak knives. Just make sure that the product uses surgical-grade steel for performance and safety. Regarding the structure, always go for a full tang knife. This design only uses one piece of steel from the blade’s tip to the handle’s end. It prevents hazardous separation of the blade and the handle while the knife is being used. Consider comfort and appearance when you think about the handle. If you want beautiful steak knives, wooden handles are perfect for you. As a plus, wood is comfortable for your hands, too. However, your priority should be size, shape, and texture. The dimensions of the handle must fit your hand perfectly. The handle should be curved as well for a stronger grip. Meanwhile, the texture needs to be smooth for comfort but nonslip for control. 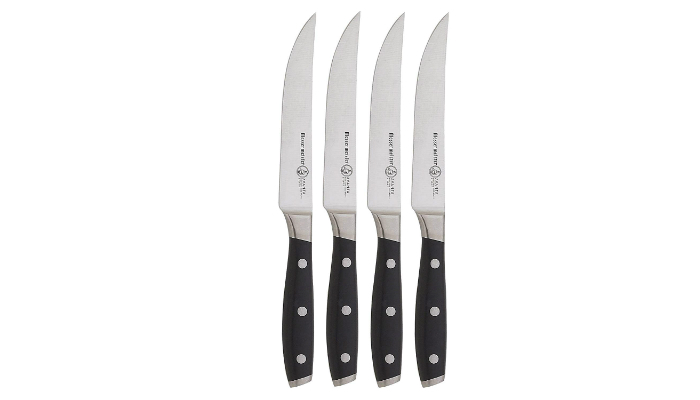 Because of its unique appearance and material, Cuisinart C55-6PCSBK Steak Knife Set is our top choice. To be more specific, its pure black appearance and special ceramic coating make it the best steak knife set for homeowners. The ceramic coating provides a nonstick surface on top of a high-quality steel blade. To keep your steak knives sharp, learn how to sharpen and hone their blades. If you’re curious about the differences between sharpening and honing, we have all the answers for you. Meanwhile, for other types of knives, check out the best kitchen knife sets.